I recently gave a short presentation to the Board of Directors of the Louisville branch of the St. Louis Fed. Following my presentation (which stimulated a lively discussion), I had the opportunity to listen to each member report on local economic conditions from different parts of Kentucky. Two themes stood out. The first was how "an air of uncertainty" along a variety of dimensions had "frozen" investment plans (with the apparent exception of younger entrepreneurs, who probably do not know any better-jk). The second was the unfilled demand for highly skilled, specialized workers (primarily in manufacturing). Drew Greenblatt has been looking for more than a year for three sheet-metal set-up operators to work day, night or weekend shifts. The president of Marlin Steel Wire Products, a company in Baltimore with 30 employees, Mr. Greenblatt says his inability to find qualified workers is hampering his business' growth. "If I could fill those positions, I could raise our annual revenues from $5m to $7m," he says. He is offering a salary of more than $80,000 with overtime, including health and pension benefits. Yet in spite of extensive advertising, he has had no qualified applicants. He is trying to train some of his unskilled staff but says none has the ability or the drive to complete the training. This quote identifies two problems. The first is what economists call "skills mismatch" caused by a "structural" shock. The second, that some workers are unwilling and/or unable to upgrade their skills is another matter that deserves attention, but is something that I will leave aside here. Apart from anecdotal evidence, how does one go about measuring "skills mismatch caused by structural shock?" One idea, initially proposed by Abraham and Katz (JPE, 1986), is to use the comovement to in vacancy and unemployment rates to identify "cyclical" and "structural" shocks. I put those terms in quotes because there are no set definitions for them. I like to think of a cyclical shock as an event that makes it more or less profitable to find the same kind of worker for the same kind of job. And I like to think of a structural shock as an event that makes it more or less profitable to find a different kind of worker for a different kind of job. Anyway, the Abraham and Katz idea is that one would expect cyclical shocks to trace out a stable, negatively-sloped Beveridge curve. 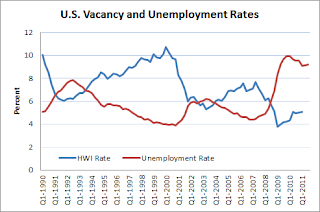 That is, one would expect the job-vacancy rate and the unemployment rate to move in opposite directions. A structural shock, by contrast, is expected to move vacancy and unemployment rates in the same direction. The idea here is that it is now more difficult to find the right kind of worker, so that even greater levels of recruiting intensity is likely to be associated with higher unemployment rates. The FT article cited above uses this idea in the diagram to the right (together with the results of a Kaufman poll of entrepreneurs) to suggest that the high U.S. unemployment rate is primarily the consequence of "structural" factors. Here is what the U.S. Beveridge curve looks like from May 2005 - November 2011 (The vacancy rate is computed from the Conference Board's help-wanted-online data, which is available from 2005 only). As the HWOL measure of job vacancies is available at the city level, Constanza Liborio and I thought it might be interesting to see how job availability varies across major U.S. metropolitan areas and how job vacancy rates correlate with regional unemployment rates before and after the beginning of the most recent recession. Specifically, the exercise we perform is as follows. Consider a major U.S. metropolitan area. Compute the average job vacancy rate and unemployment rate for this metropolitan area over the prerecession period May 2005 – November 2007. Recalculate these averages since the beginning of the last recession, December 2007 – November 2011. 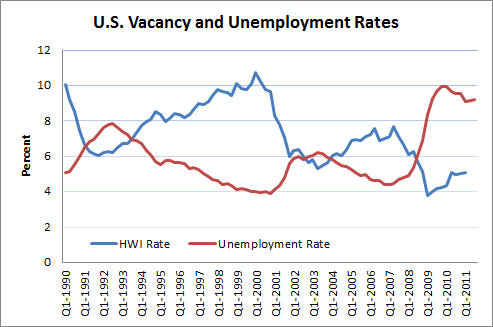 Next, compute the change in the vacancy rate and unemployment rate across these periods. Perform this exercise for a set of the largest metropolitan areas in the U.S. The results are displayed in the following figure. Not surprisingly, we see that the unemployment rate in all these metropolitan areas went up since the recession began. However, the same is not true of job vacancy rates (that is, not all vacancy rates went down, as one might have expected). Specifically, while we observe the typical Beveridge curve dynamic in many jurisdictions (suggesting that cyclical factors are dominant), we also observe vacancy rates remaining relatively stable, or even rising, in several others (suggesting that structural factors are dominant). So the tentative conclusion here is that the relative importance of cyclical vs. structural factors appears to vary across regions. To the extent that monetary policy is an effective stabilization tool, it cannot be expected to impact all regions of the country equally. In many regions, localized fiscal policies (education and training subsidies, etc.) may prove to be a more direct and effective tool. Back when the Greek crisis was just breaking, I remember having my morning coffee, still half asleep, TV turned on in the background, when I heard a news reporter ask an interesting question. I put my coffee down and turned to the TV. The Parthenon was in the background, communist banners were draped about, and small smokey fires burning here and there. And the reporter, standing excitedly in the middle of all this, rather earnestly asked what I thought was a very good question: Why should Germany even consider bailing out Greece? "Why?! Let me tell you why, people..." [turns head to the left] "As I look over here, I see and Audi and a BMW..." [turns head to the right] "...and as I look over there, I see a Mercedes and a Volkswagen!" [turns to camera--big light bulb flashing over his head] "Greece is an extremely important export market for Germany!" So as far as I can gather, what the fellow is trying to tell us is this. The Germans should forgive Greeks their debts because, well, how else will the Greeks continue to afford importing German-made cars? After all, it is the Greek consumer that is selflessly keeping the German autoworker employed. Moreover, it has been a fine recipe for keeping German unemployment low, and growing German wealth. Yes, that's right...wealth in the form of...well, you know...grade A assets, like Greek government bonds. But the Germans believe that their own experience shows that austerity works: they went through some tough times a decade ago, but they tightened their belts, and all was well in the end. Not that it will do any good, but it's worth emphasizing that Germany's experience can only be generalized if we find some space aliens to trade with, fast. Why? Because the key to German economic affairs this past decade has been a truly massive shift from current account deficit to surplus. Now, other countries within Europe could emulate Germany's past if Germany herself were willing to let its current account surplus vanish. But it isn't, of course. So the German demand is that everyone run a current account surplus, just like they do -- something that would only be possible if we can find someone or something else to buy our exports. It remains remarkable to see with how little wisdom the world is governed. Now, I'm not sure whether any German really has made an explicit demand for all countries to run current account surpluses. But if anyone did, it would clearly be silly. The current accounts of all countries must necessarily sum to zero; at least, in the absence intergalactic trade. But then, that sort of gave me an idea. Why not a world current account surplus? What is an account, anyway? It's just a book-entry object. Let's give the account owner a proper name. And what's in a name? May as well call the account holder "Space Alien," with a "local" delivery address, say, the Pacific Ocean. Next step. Contract some agency to print up Space Alien bonds, rate them AAA, then use them to acquire goods from all over the world, including ocean vessels. That should lower world unemployment. Then load the vessels with the newly purchased cargo, sail them out to their delivery point (the mid Pacific, say), and sink them all. (This last step is absolutely necessary, as sending the goods to any country on earth will mean job-killing imports for that country, jeopardizing their current account surplus). Alas, the Space Aliens will ultimately have to default on its debt but, you know, who really cares? Just means more work is needed to replenish our lost wealth. 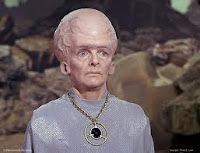 Now, if you think this sounds a little loopy, let me direct you to this: Fake Alien Invasion Would End Economic Slump. Of course, this is all just a variation of the old Keynesian prescription of employing people to dig up holes and fill them up again. And, contrary to what you may be thinking, the purpose of this post is not to argue against the ability of such a program to increase net employment. What I want to question instead is why running a current account surplus is necessary for all this hocus pocus to work? Here's an idea. Instead of exporting vehicles to Greece, why don't German car manufacturers ship their cars to domestic German residents instead? The domestic purchasers could pay for the cars by issuing fake paper, just like their foreign counterparts. And when the time comes to default, well, at least all the BMWs, Audis, Mercedes, and Volkswagens will be residing on German soil. Since I happen to have handy some regional data on the help-wanted index (HWI) for the U.S., I thought it might be interesting to see whether U.S. vacancy and unemployment dynamics in a cross-section display any interesting patterns. (I would like to thank Kyle Herkenhoff for suggesting this exercise to me). As one would expect, there is a strong negative correlation between vacancies and unemployment; this is the so-called Beveridge Curve. Labor economists sometimes like to gauge labor market conditions by constructing a "labor market tightness" variable--the ratio of vacancies to unemployment, or the v/u ratio. The v/u ratio plays a prominent role equilibrium unemployment theory; see Diamond, Mortensen and Pissarides. As the following diagram shows, labor-market-tightness is highly procyclical. The following diagram plots the unemployment rates for 36 metropolitan areas in the U.S. The solid black line is a population-weighted average (it corresponds to the national unemployment rate). The figure shows that there is significant disparity in regional unemployment rates at all points in the business cycle. As the U.S. economy emerged from the recession in the early 1990s, regional variation in unemployment rates seems to have declined for the rest of that decade. Nothing much changed until the most recent recession, where we see a dramatic increase in both the average unemployment rate and its in its dispersion across regions. Next, let's take a look at regional "vacancy rates" (the city-based HWI divided by regional labor force). The dispersion in regional vacancy rates appears to be very, very large (measurement error?). Using my eyeball metric, it appears that the dispersion in vacancy rates is somewhat procyclical. In particular, look at how the dispersion appears to increase throughout the 1990s expansion--at the same time, the dispersion in unemployment rates is declining. This suggests that the dispersion in labor-market-tightness is procyclical; and indeed, the following diagram shows this to be the case. It would be interesting to know what might be behind these regional differences in labor market tightness, and why this regional dispersion varies over the business cycle. First, what accounts for the dispersion? In a basic Mortensen-Pissarides labor market search model, extended to incorporate regions, I think that the labor-market-tightness variable is likely to equate across regions (at least, allowing for factor mobility). Regional differences in tax rates, etc., might account for some of the disparity. But the measured disparity is huge. Second, what accounts for the cyclical properties of the dispersion? Is it simply the case that some regions are populated by industries that are more cyclically sensitive to aggregate shocks? Or is it the case that the shocks themselves are concentrated in certain regions, with the effects propagating to other regions of the country?